The SIGNAMAX Certified Partner Program was created to make a network of partners to carry out the design, installation, & maintenance of our products to ensure the longevity of our end user’s investment. Companies and individuals working in the cable installation, infrastructure, and design environments know there is more to building a cabling system than just buying good quality cable and connecting hardware and that’s who we want to partner with. Companies and individuals working in the cable installation, infrastructure, and design environments know there is more to building a cabling system than just buying good quality cable and connecting hardware and that’s who we want to partner with. Once you are a SIGNAMAX Certified Contractor you can start earning cash back and additional year-end prizes, just for being a loyal SIGNAMAX partner. The SIGNAMAX Certified Contractor Rewards Program was designed for our certified partners working in the network installation industry who honor us with the ability to serve their customers with quality equipment to suit their infrastructure needs. 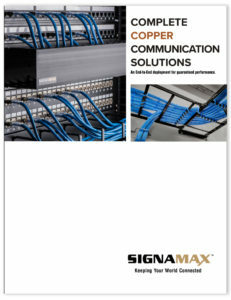 If it’s part of the link and the lifeline that keeps your networks running, then it’s covered by the Signamax 25-Year Cabling System Limited Warranty. From our patch panels and 110 cross connect systems to our outlet products and the cable that links it all together, our warranty program gives you the assurance that you need in the constantly changing world of network technology. When you work with a Signamax Certified Installer or a Certified Consultant who specifies and installs the Signamax Category 6A, Category 6, Category 5e, or our Optical Fiber System, including cables from our list of approved cable manufacturers, you can rest easy. Our warranty assures that your system will be free from defects, will meet or exceed ANSI/TIA-568-C and ISO/IEL 1180 cabling performance specifications (in effect at the time of manufacturer), and will support any current or future application designed to operate over the applicable Cabling System (in effect at the time of manufacture). You’re covered for material and labor for 25-years from the date your installation is approved and registered with Signamax.